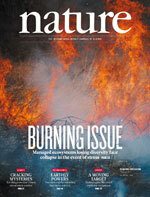 A project I worked on with Andrew MacDougall, based at the University of Guelph, was the cover article published in Nature: 494, 86-89 (February 2013). Long-term and persistent human disturbances have simultaneously altered the stability and diversity of ecological systems, with disturbances directly reducing functional attributes such as invasion resistance, while eliminating the buffering effects of high species diversity1, 2, 3, 4. Theory predicts that this combination of environmental change and diversity loss increases the risk of abrupt and potentially irreversible ecosystem collapse1, 2, 3, 5, 6, 7, but long-term empirical evidence from natural systems is lacking. Here we demonstrate this relationship in a degraded but species-rich pyrogenic grassland in which the combined effects of fire suppression, invasion and trophic collapse have created a species-poor grassland that is highly productive, resilient to yearly climatic fluctuations, and resistant to invasion, but vulnerable to rapid collapse after the re-introduction of fire. We initially show how human disturbance has created a negative relationship between diversity and function, contrary to theoretical predictions3, 4. Fire prevention since the mid-nineteenth century is associated with the loss of plant species but it has stabilized high-yield annual production and invasion resistance, comparable to a managed high-yield low-diversity agricultural system. In managing for fire suppression, however, a hidden vulnerability to sudden environmental change emerges that is explained by the elimination of the buffering effects of high species diversity. With the re-introduction of fire, grasslands only persist in areas with remnant concentrations of native species, in which a range of rare and mostly functionally redundant plants proliferate after burning and prevent extensive invasion including a rapid conversion towards woodland. This research shows how biodiversity can be crucial for ecosystem stability despite appearing functionally insignificant beforehand, a relationship probably applicable to many ecosystems given the globally prevalent combination of intensive long-term land management and species loss. This article has been Recommended by F1000.